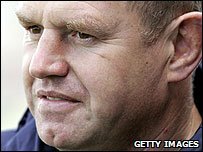 Dean Richards has resigned from his position as director of rugby at Guinness Premiership side Harlequins. His decision comes after the one-year ban given to Tom Williams for faking a blood injury in last season's Heineken Cup quarter-final against Leinster. The club was also fined £213,000 by the European Rugby Cup panel. Richards offered to step down during the process and a club statement on Saturday confirmed that his decision had been accepted. Williams has lodged an appeal against the sanction with European Rugby Cup (ERC). Meanwhile, the ERC disciplinary officer has separately appealed against the level of sanction imposed on Harlequins and the decision to dismiss misconduct complaints against Richards, Dr Wendy Chapman and physiotherapist Steph Brennan. Quins are currently reviewing the whole incident, and the statement read: "During the course of this process Dean Richards unreservedly tendered his resignation from his post as director of rugby. The board of Harlequins has accepted his resignation." Richards and two members of the club's medical team had misconduct charges dismissed but Williams and Quins were both found guilty of fabricating a cut to the mouth in order to allow substituted fly-half Nick Evans to return to the field with five minutes remaining of the match. Television cameras spotted Williams winking towards the bench with "blood" smeared around his mouth. The statement continued: "Following the hearing held and decision made by the ERC panel on 20 July, the club has conducted its own review of the incident. This review is still ongoing. "As part of this process, the club has waited for the written judgment to ensure it had considered carefully the concerns and position of the ERC disciplinary panel. "The club fully accepts the verdicts and sanctions imposed upon the club since it is accountable for the failings of its staff. "The club feels strongly that the severity of the sanction meted out to Tom Williams is unfair and disproportionate and the club will support him in the event of an appeal on his part against the 12-month playing ban currently in place. "We acknowledge that this whole episode has tarnished the image of the club, which has always sought to uphold the highest standards. "The level of scrutiny that clubs such as Harlequins now find themselves under means that procedures and processes which may have served us well in the past are no longer adequate. "The club is urgently undertaking a thorough review of its internal policies with a view to establishing an appropriate ethics code for all staff (both playing and non playing) covering a wide range of areas including respect for the laws of the game. "While this process is still progressing there will no further comment."